Back to a slower, more simple, and ‘acoustic’ sounding music. We also introduce another new voice. A slower talking, male voice, with a deep resonance. We thought this ‘fourth voice’ would appeal to still another demographic, and also sound ‘reassuring’, especially during this ‘financial’ presentation. We ONLY used words the from REAL ‘Thank You’ letters. We then coached, and recorded, four ‘non professionals’. Once again, having a voice that the viewer can relate to is VERY important. 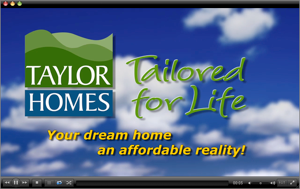 Because Taylor has built THOUSANDS of homes and has hundreds of letters on file, we just decided to go with a simple ‘filmstrip’ across the bottom representing their various customer types. 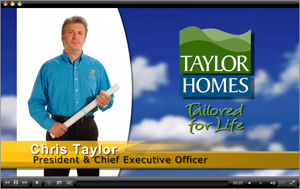 For our closing and ‘call to action’, we had the CEO re-state, and in a different way from the ‘Welcome’ chapter, the benefits of buying a custom home from Taylor. The music and the pacing are the same as the introduction. 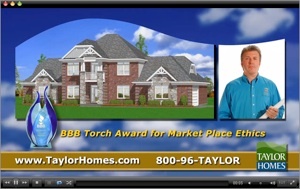 He finishes with a ‘confident’ challenge for the viewer to “shop around” and invites them to contact Taylor Homes. Simple, direct, and positive! Now we slow it down a bit. You’ll notice the announcer speaks a phrase, and then the viewer has a moment to ‘absorb’ that information while the supporting graphic is revealed. While the lists are displayed, the announcer helps lead the viewer by only speaking some of the features. Speaking any more than that might ‘overload’ the viewer. The music speeds up again, but what really engages the viewer with this short chapter is the timing and varied movement of the house photos. You’ll notice they are moving with ‘selected’ beats in the music. The viewer not only ‘hears’ the rhythm, but ‘sees’ it as well. We also removed the color from the clouds at the beginning. This helps remind the viewer that we are in a new ‘chapter’. The music slows down, and has a noticeably different style as we introduce a new announcer, in this, the most complex video, in the series. Often, there are over fifteen ‘layers’ of ‘separately animated’ graphics subtlety moving over one another. Many times, when one graphic moves, it leads your eye to the next one to appear. It’s the ‘visual complexity’ of this chapter which makes it so engaging. This is the complete video. We only included this so you could watch the whole presentation in HD. This same video is at the top of this web page, however, that one is highly compressed, of lower quality, and not as large. The ‘HD version’ file is quite large (@ 450 MB). So for slower Internet connections, you may want to view the ‘standard’ version. To establish a ‘friendlier’ tone right from the ‘get-go’ we had the CEO deliver a very personalized greeting. Because their logo is very ‘organic’ and has ‘curves’ we try to use those shapes whenever possible. You’ll also notice the acoustic music is ‘warmer’. This video steps up the pacing with much faster, ‘non acoustic’ music and a very articulate, and intelligent sounding female voice. 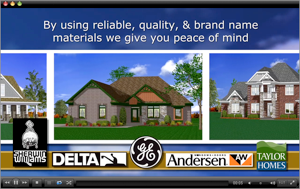 She ‘assertively‘ tells you why Taylor builds great homes. We thought a female voice would be better as the final ‘decision maker’ for most home sales is usually a woman. 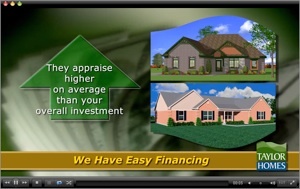 We produced this video for a well known homebuilder. 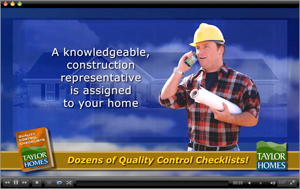 They build custom homes in six states, per client specifications. 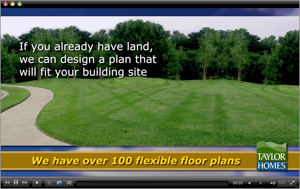 This video is played both in their model homes and on a DVD that is given to prospective buyers. This video is 15 minutes long. Because they have a lot to say, we edited their content into seven chapters. Each chapter has a different look, different 'pacing', different music, and even sometimes a different narrator. This also makes it easier for the viewer to 'digest' the message and helps hold their interest for this 'longer-than-normal' presentation. Of course we placed common ‘elements’, and used a common ‘color pallet’ in all the chapters to 1) give them a consistent 'look and feel' and 2) to reinforce the Taylor Homes 'brand'. However, we did use different voices to make it more ‘relate-able’ to the different types of people who might be watching them.  Below, you will see each of the chapters, in proper order, and with a brief description of our design philosophy for each. 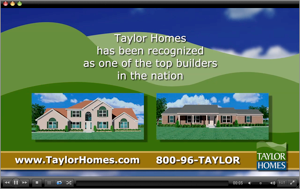 BTW, their web site is www.taylorhomes.com. Click on any of the chapter videos below to play a LARGER and HIGHER QUALITY version of it in a SEPARATE WINDOW. If the HD version won’t load quickly enough, we suggest you view the ‘standard’ version instead.